A highly anticipated event in the city’s architectural calendar, Open House Lagos is a unique celebration of the buildings, places and spaces where we live, work and play. It provides an opportunity to see, explore and learn about Lagos’ amazing architecture and design over one weekend. With over twenty buildings opening their doors to all, Open House Lagos selection will showcase beautifully designed residences, innovative infrastructure projects and prestigious civic buildings all for free. The showcase is scheduled to take place from Friday 29, April to Sunday 1, May 2016. Focusing on the importance of good design in creating and sustaining a vibrant city, it is a unique opportunity to know on a first hand basis what makes Lagos the great city it is today and while creating a platform to be inspired by the power of architecture in transforming the quality of our lives. Open House Lagos tells the story of progressive growth of architecture in Lagos, exploring the diverse historical buildings we have protected for years while unraveling contemporary designs. Lagos citizens will find out more about issues that are relevant to their local area – from the design of homes to the impact of climate change, and the role of architects and contemporary design in revitalizing a city. Highlights of Open House Lagos include: access to some of newest, most innovative constructions in West Africa and many homes of modern and classical architectural distinction. Visitors can also join in themed bus tours led by well-informed, trained tour guides and take home festival memorabilia including the limited edition festival guide. The Open House Worldwide Family brand was created in 2010, connecting a community of over 30 cities who organise annual events with the same model, and an audience of over 1 million people who participate in Open House events across the globe. The concept’s success is due to it acting as an exemplary model of engagement with a city’s citizens, and a step towards bridging the gap between experts and users. 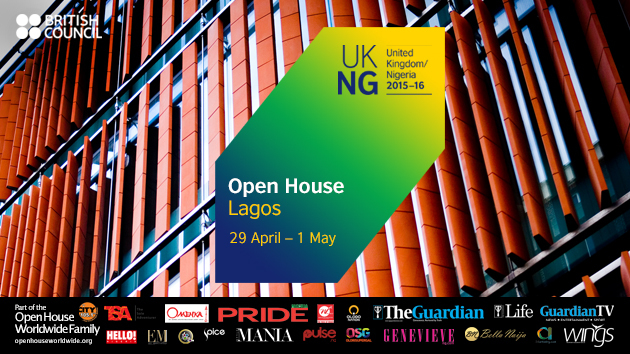 Open House Lagos is proudly supported by Sterling Bank Nigeria, Citi FM, WFM, Spice TV, Guardian TV, The Guardian, Hello Magazine, Mania Magazine, Genevieve Magazine, Wings Magazine, Exquisite Magazine,Guardian Life, Bellanaija, 54 Artistry,Pride Magazine, TSA, Olorisupergal, Olodo Nation, 360 Nobs, Guardian Arts and Pulse NG.